This boat is not the same one as Yates' Carol Anne. The owner has done much tracing of previous history and has disproved several possibilies! The HNBOC archive has the full story, as supplied by the owner, on record. However, the originally double ended wooden joey has been motorised over a number of years with the following engines : Perkins P 6 in 1980s at Coombeswood , 'Ailsa Craig twin' in 1987 then a Perkins P 4. The original boat is the dayboat OLIVE, built in 1944 for and by Samuel Barlow Coal Co at Glascote, fleet number 56 (replacing an older boat of that number) and first gauged as BCN 2226 on 6th Dec 1944. 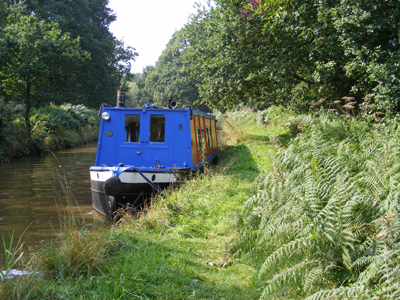 The boat was sold to the British Electricity Authority and was first gauged by them in 1953. She was converted into the house-boat CAROL ANNE in the 1960s, and was recorded at Norton Canes with both that name and the BCN 2226 plaque in 1969. The boat was sold several times in the 70s and 80s with no change of name. In 1984 she was moved to Hawne Basin, found to be badly rotten and her planks were replaced with steel welded to original frames (with new frames also added) - this had already just been done at the same site to the Runcorn boat Betty (still there and being lived on when I visited in 2000). At the same time, the stern of the boat was replaced by a motor stern from the cruising boat CORNELIAN, which was having a new stern fitted to accommodate wheelchairs. The boat was still called CAROL ANNE for a while and still in her usual green housenboat colours, but in 1986 she left as a cruising boat, painted black and purple and called Black Witch. She was then sold on to be a houseboat again in March, Cambs, in 1990, and bought by her current owner in 1992. 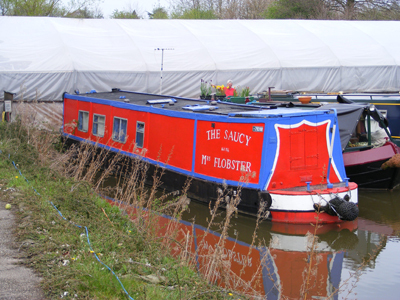 At the time there was no name displayed so she was given the name "The Saucy Mrs Flobster" (after the ship in the Beachcomber story, that had to be restored because she was too wet to burn).